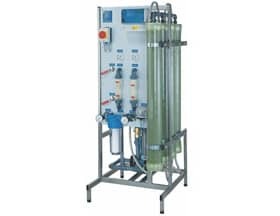 Reverse Osmosis is a highly effective physical water technology employing high pressure across a semi permeable membrane to separate out otherwise harmful particulate, ions and bacteria. In reverse osmosis, an applied pressure is used to overcome osmotic pressure (that is driven by chemical potential differences of the solvent). The result is that the ‘concentrate’, is retained on the pressurized side of the membrane and the ‘permeate’ in this instance ‘pure’ water is allowed to pass to the other side. This non-chemical process provides an excellent solution in the production of high quality RO water across a broad spectrum of applications. 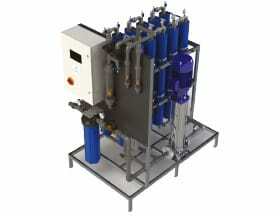 AllWater Technologies has a range of Reverse Osmosis machines including the SUPERMINI, MINI, MIDI & MAXI RO Units. 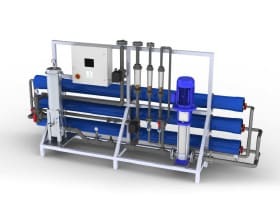 These reverse osmosis systems provide flow rates from 300 litres to 25m³ per hour with additional pre and post treatment equipment to suit all industrial applications. AllWater Technologies Ltd are always happy to work alongside you, using their engineering expertise & experience to design for individual needs, offering a fully bespoke, turnkey package. The SUPERMINI Reverse Osmosis range is a commercial RO unit designed with reduced complexity representing good value, efficient entry-level plant to cater for commercial flow requirements in less critical applications. It offers easy compact installation and operation whilst retaining high-performance low energy membranes and permeate recycle as standard. This, coupled with a programmable controller gives this entry level unit a strong footing within the AWT product range. OS 3030 Programmable controller for RO monitoring and control providing a continuous display of permeate conductivity, plant status and hours run. High level of instrumentation with flow monitoring on permeate, concentrate and concentrate recycle. Permeate recycle as standard to reduce water wastage and extend membrane life. Automated Permeate quality monitoring and control. Facility for sampling permeate from individual RO membrane vessels. Full mechanical and electrical assembly on 304 stainless steel skid, complete with adjustable legs. Small footprint required for installation. Low energy reverse osmosis membranes. 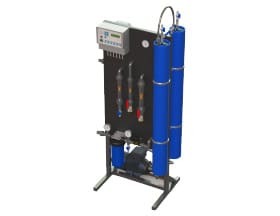 The MINI & MIDI Reverse Osmosis range is an RO unit designed with many advanced features as standard, reducing the need for additional controls and plumbing on site and making these models competitive as a highly functional plug and play unit incorporating facilitation of future plant expansion. This flexibility is principally provided through the control system design. Colour touch screen interface for RO monitoring and control providing a continuous display of permeate conductivity, plant status and hours run. Alarm logging facility with storage available for 50+ alarms. Common alarm signal available as volt free contact. 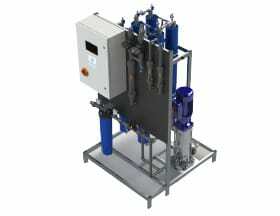 Options available for control of raw water and treated water pumps. The bespoke MAXI Reverse Osmosis range completes the AWT Reverse Osmosis offering, providing a cost effective solution for significantly higher volume production rates and many additional features and options. All AWT RO systems are designed, built and tested at our UK manufacturing facility enabling observation of full factory acceptance testing prior to delivery. All plant is also fully supported with on-going preventative maintenance being provided for additional peace on mind by our national team of in-house engineers.